Bond University is pleased to offer scholarships for international students. These scholarships will be awarded to undertake single or combined bachelor or master’s degree program. Bond University aims to offer the best and brightest students from around the globe, with tuition remission scholarships based on academic merit, as well as community, leadership and sporting achievements. Students from any country can apply. 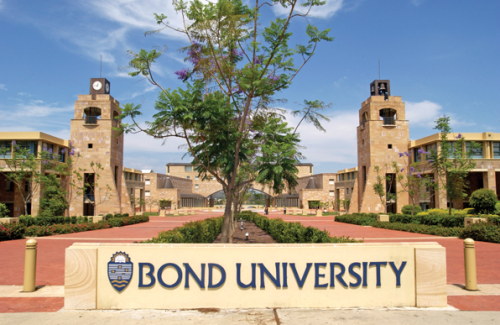 As Australia’s first private non-profit university, Bond University seeks to be recognized internationally as a leading independent university, imbued with a spirit to innovate, a commitment to influence and a dedication to inspire tomorrow’s professionals who share a personalised and transformational student experience. Course Level: Scholarships are available for pursuing undergraduate and postgraduate degree program at Bond University. Study Subject(s): Scholarships are awarded in all subjects. Scholarship Award: These scholarships will award up to 50% tuition remission for students commencing in January, May or September (please note that the deferral of a scholarship will only be granted in extenuating circumstances, such as illness, family bereavement or essential overseas travel). Scholarships cover either a single or combined bachelor or master’s degree program. Available to all international students applying for any undergraduate or postgraduate degree combination. Nationality: International students are eligible for these scholarships. 1. Entrance Requirement: Applicants must have the outstanding academic ability, demonstrated strong leadership skills and extensive involvement in extracurricular activities. 3. English Language Requirements: Students whose first language is not English must refer to and meet Bond University’s standard English entry requirements for undergraduate applicants and English entry requirements for postgraduate applicants. How to Apply: The mode of applying is online. Applicants will be asked to submit academic statements, a summary of achievements, and letters of reference from relevant individuals who can support their application. They will also be asked to submit a 500-word personal statement outlining key achievements and attributes. Now that all the information about Scholarships in Australia at Bond University for International Students has been delivered nicely; talented students who are eager to pursue their Free Tuition/Scholarships/Study in Australia can apply now.